A good few weeks back I treated myself to one of my favourite perfumes. And why not. I'll tell you why not. I would have been totally wrong not to get it as QVC, the best shopping channel had it on easy-pay. If you don't know what that is, it's a kind of instalment payment plan, which means you can spread the cost over a few paydays!!! My last bottle has about run out so I couldn't let it pass me by, I'd never have forgiven myself. 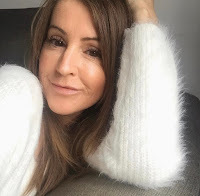 I don't actually buy much from shopping channels, that's the truth, apart from some of my Elemis skincare products and other beauty products every now and then, they're all quite costly and it's great to not have to pay out a hefty amount all at once. This is Liz Earle's very first fragrance and Mr C bought it for me for Christmas the first year it was launched. I absolutely adored it and it always reminds me of Christmas day when I wear it, even when it's July!!!! This one's hard to describe, it's sensuous, vibrant, fresh and uplifting all at the same time, yet comforting. It's eau de parfum so has more staying power and it lingers on the skin all day. I have tried the other Liz Earle fragrances but always, always come back to this one. No1. It's such a heavenly scent. The bottle itself is so elegant and it comes in such a cute little box, you don't want to throw it away! If you want to try before you buy you can head to QVC or pop along to a Liz Earle counter to test them all and find your favourite, I promise you won't be disappointed. Head to the Liz Earle website to find your nearest store. Do you stick to one fragrance or do you like to change each day?